Submission of data is voluntary, yet indispensable to execute queries. Personal data can be accessed, corrected or withdrawn any time at request. Apart from a wide range of unique systems, we provide multiple services which aim to deliver a comprehensive solution for any type of airline. Digital information services provider incorporates weather and turbulence forecasting into new S4A suite of airline operations products. 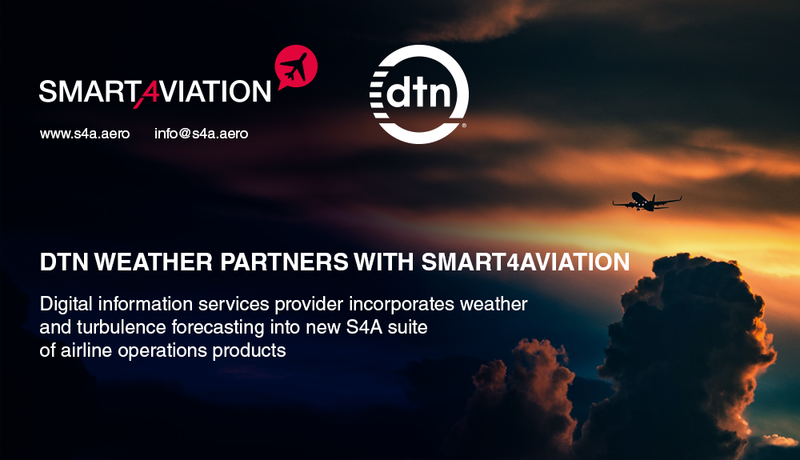 Minneapolis, (September 10, 2017) – DTN, a leading provider of information services, announced today that it is partnering with Smart4Aviation (S4A) to provide real-time aviation weather information and Eddy Dissipation Rate (EDR) turbulence forecasting in the S4A suite of products. Smart4Aviation’s latest solutions are geared towards airline operations which will incorporate DTN Weather information and ERD turbulence forecasting. S4A Smart VIEW+ (flight tracking solution) or, S4A Smart COMM (advanced communication and alerting system) are only some of Smart4Aviation’s products which successfully combine an industry-leading technological software with reliable and accurate weather information and forecasting tools for the aviation industry. DTN has been recognized by ForecastWatch as the industry-leader for forecast accuracy for 10 years running. The company aims to continually innovate and advance its top-rated weather and turbulence forecasts. Partnering with Smart4Aviation establishes a new generation of product and service delivery. Together, we offer industry leading flight operations software solutions designed for providing and communicating accurate weather information necessary when making critical operational and business decisions.